There is no doubt that we miss our San Francisco Giants that are now unavailable due to injuries. It has been a brutal season so far when it comes to our guys getting hurt and as a mother and fan that is always scary! Thankfully nobody who has been placed on the DL was critically injured but they can’t play baseball and that makes everybody unhappy, the player’s themselves, management, and of course the fans. So how is everybody doing? When will we see them strut proudly on to the playing field once again sporting that Giants uniform as opposed to whatever pj’s or sweats that is now their “waiting it out” attire? Tonight we take on the Padres from home with Barry Zito facing off against Edinson Volquez. Home Sweet Home! 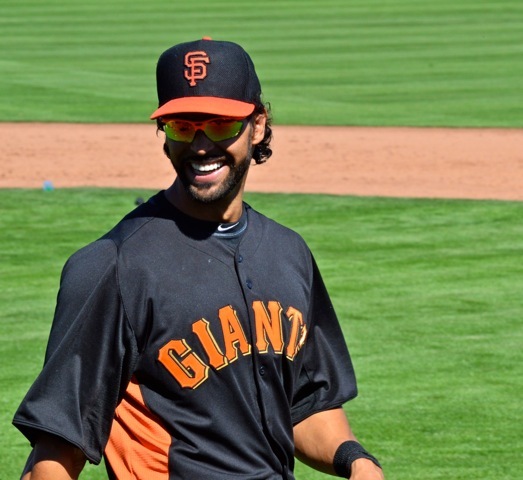 Angel Pagan will run the curve of the infield today, the latest step in a rehab process that he admitted has been reset this week. Pagan had a platelet-rich plasma injection last Sunday in Arizona because his strained left hamstring simply wasn’t healing. At one point, surgery was presented as an option that would put him out for about six to eight weeks. “I wasn’t going to do that,” Pagan said. “It’s much better now, better than I thought it would be. We’re ahead of schedule. I’m very optimistic I’m going to be in the lineup soon, but when, I don’t know. Bruce Bochy doesn’t know, either. Pagan still needs to be able to run the bases pain-free, and that’s a step that’s a few beyond just running the curve. Last time Pagan tried to run the bases, after a cortisone injection, “It wasn’t so good,” he said. When he is deemed ready, Pagan will get 10-15 minor league at bats in San Jose or Fresno.